Both bitcoin skeptics and supporters get too hung up on the price. If the price is up, bitcoin is taking over the world, say the supporters. If the price is down, it’s proof that bitcoin is a scam or a bubble, according to the skeptics. The problem with this simplistic analysis—it depends on the whims of a very volatile monetary instrument. Supporters thought the financial revolution was here at $20,000 in December of 2017. Skeptics thought bitcoin finally died when it briefly crashed below $6,000 in February of 2018. Now at around $10,000, both camps are taking a breather and it’s time to look at fundamentals again. Bitcoin’s fundamental value proposition is to compete with fiat money and gold to serve as a store of value and medium of exchange. It serves both these functions—though, like fiat, gold, and other cryptocurrencies—it’s not perfect. Despite the ups and downs in price, this value proposition hasn’t changed. If anything, the bitcoin payment network is making progress with some successful tests of the second layer scaling solution called the lightning network. It promises to solve the 400,000 transactions per day limit on the dogged and old bitcoin blockchain. The lightning tests so far have proven that payments on this second layer solution are almost instantaneous, unlimited, and much cheaper than the transactions on the original blockchain. The tradeoff is some centralization on the lightning network, but giving up decentralization to reach scale is a problem every payment system faces. In fact, scaling could boost bitcoin adoption across the globe and make the cryptocurrency less volatile. If more people use it to buy everyday products rather than just trade it against fiat currency, prices will become more stable. Scaling would also help bitcoin bypass the insufferable banking system by making it possible to manage both long-term savings and short-term spending all in bitcoin, without having to switch back and forth into fiat. A huge bonus. In terms of valuation, whether the bitcoin market cap trades at $100 billion, $200 billion, or $300 billion at the top, it’s a far cry from fiat money, which depending on how you count, ranges from $50 trillion to $100 trillion across the globe. Even gold is worth much more, at $8 trillion to $10 trillion. But the Big Kahuna, the United States of America, so far hasn’t actively harmed bitcoin, and regulators are coming out with rather positive statements. These include this remark from the Chairman of the U.S. Commodity Futures Trading Commission, Christopher Giancarlo: “It strikes me that we owe it to this new generation to respect their enthusiasm about virtual currencies with a thoughtful and balanced response, not a dismissive one, and yet we must crack down hard on those who try to abuse their enthusiasm with fraud and manipulation,” he said at a Senate Hearing in February. He also said that his kids prefer to invest in bitcoin rather than the stock market. Another value proposition of bitcoin is that, like gold, it lives outside the banking system. Even if all banks shut down, as they did in Cyprus in 2013, bitcoin will continue to function as a payment system. However, until we get to this complete system meltdown not seen since the 1930s Great Depression, the price of bitcoin is at the whim of the credit system as well. Although bitcoin cannot be as easily collateralized as stocks and houses, exchanges do enable margin trading. During the last euphoria in December, it became clear that many people took out other forms of loans to invest in bitcoin and crypto. Those are the classic hallmarks of a bubble. The good news is that the recent crash in price should, by and large, have washed out those levered speculators and they should be burnt so badly that they won’t come back in the near future. So what could push bitcoin prices closer to a competitive valuation versus gold and fiat? The expectation among many was that institutional money would come in at the beginning of 2018; even a one or two percent allocation in the portfolios of pension funds or family offices across the globe would have easily pushed bitcoin to $30,000. But this did not happen for two reasons. First, the mini crypto bubble crashed in December, and even though the assets were a lot cheaper to buy, institutions prefer to buy into a rising market because it makes them feel safer. 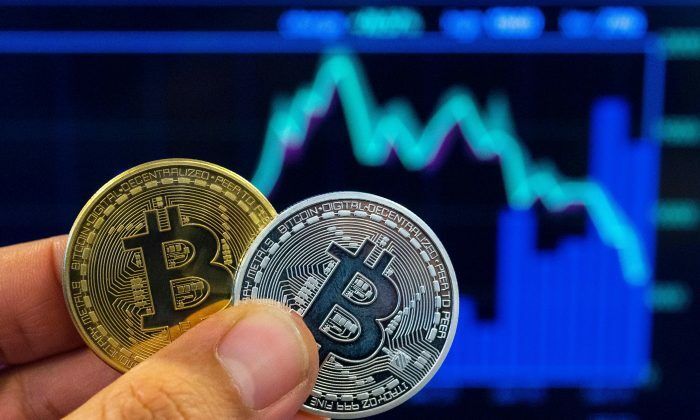 The other obstacle for institutional money to flow into bitcoin and crypto is that the stock market finally cracked at the beginning of February that many are now looking to reduce risk, not increase it. It is fiat dollars, after all, that boost stock prices as well as the bitcoin price. If they are drying up because of rising interest rates, or they’re needed to cover losses elsewhere, few investors are going to feel adventurous enough to get into bitcoin. So bitcoin depends on the credit cycle, and the current cycle harbors enormous uncertainty. Despite its manic rallies and crashes during its 10-year history, bitcoin has only ever experienced one credit cycle, and that was an inflationary expansion across the board. Now with central banks tightening and long-term yields rising, these fundamentals have changed. It would be foolish to expect new highs in bitcoin if 2018 plays out like 2008, or even 2000 in the stock market.